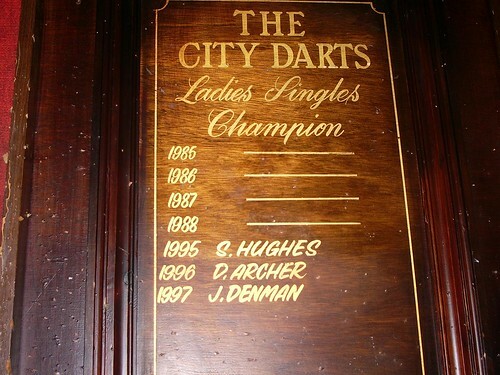 Regardless of what happened to the female darts community of East London between the years of 1989 and 1994, what on earth happened to the champion(s) from ’85 to ’88? Did she commit a crime so heinous she had to be struck from the record? Running off with the Landlord’s wife, or his dog perhaps? Or maybe genetic testing revealed “her” to be a man, fooling fellow contestants with ample moobs and an unmatched appetite for Pinot Grigio. Maybe we shall never know. If you can shed any light on this mystery, please spill the beans below.